I was jumping around MSNBC.com this afternoon when I came upon the MSNBC TV page and noticed something different on the main banner. At first I thought it was Tamron Hall’s picture being included with MSNBC’s “Heavy Hitters” (more on that in a moment) but then I came to the conclusion that all those pictures were newly added. My confusion arose from the fact that the old MSNBC TV page would show all the “Heavy Hitters” at the top but when the page was revamped, these photos came down. Originally after the revamp the banner ad was just a changing set of images that showed what was either on the air at the moment or highlighted a particular show to air later. But now the heads are back and they’re interactive. Click a head – or pair of heads in the cases of Joe and Mika or Chuck and Savannah – and the background image changes to a show specific image. But back to Tamron Hall’s picture. 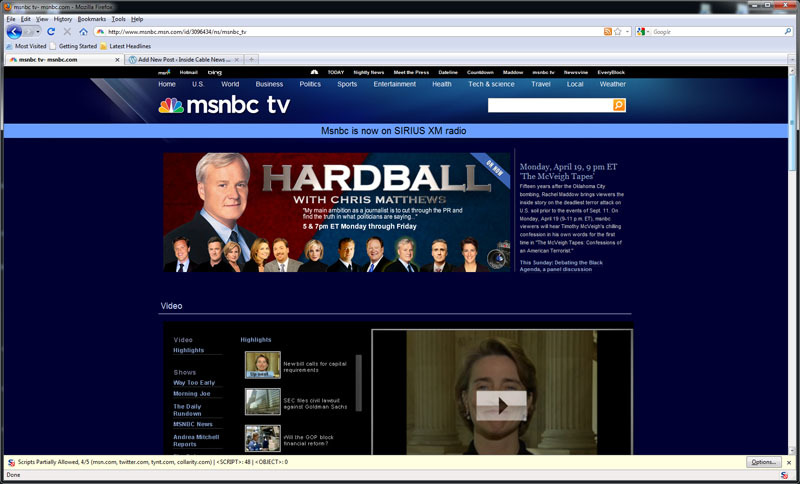 As I said Hall’s inclusion with the “Heavy Hitters” of MSNBC is a bit strange. MSNBC has never before bothered to put any of its M-FR dayside news talent in with the ones that get all the attention. It’s not like Hall’s two hours are fundamentally different in either format or subject matter from what airs at 10, 12, or 3pm ET aside from the fact that they still have segments from inside the control room. So the question arises: Why put Hall up front and center, literally center in this case, with a picture that is fundamentally different from the subued wardrobe theme that everyone else is sporting (which just about guarantees that Hall is the one you’re going to notice first because her picture sticks out so)? Well the possible explanations could be endless but let me float the one that I find the most interesting. NBC, and other TV news organizations has been weathering periodic charges of lack of diversity in the newsroom. I’ve never been a big believer in this argument, especially in NBC’s case, because I have repeatedly heard that NBC News President Steve Capus is a huge proponent of diversity in the newsroom. But the charges are still being thrown about out there. The Tea Party Movement directly criticized the very group picture on the old MSNBC TV site, that I mentioned above, as not having a single minority there. Well it does now. I would hope that Hall’s placement there isn’t just to shut up some pesky activists because I would hope that we’ve grown up enough as a nation to not have to resort to cheap symbolism to counter absurd hysteria. Yes, racism still exists and, yes, people use the race card all the time to futher their own agendas. But I would rather have a company under fire for some charge that is patently inaccurate come out and defiantly and vigorously defend itself publicly when it has nothing to hide or prove, than to see some quiet behind the scenes response that suggests the company is more interested in staying out of controversy rather than dealing with the situation on the merits…and in this case the merits are zilch; the PC response if you will. Update: As a commenter noted, MSNBC is now also running a pro-mo for Hall on their air. I haven’t seen it yet so I don’t know the content. Still the question hangs, “Why now?” Hall’s been with MSNBC for a few years now so why the sudden push? This is atypical promo behavior unless it’s part of a dayside wide series of promos which MSNBC has run occasionally in years past. This entry was posted on July 20, 2010 at 1:18 pm and is filed under MSNBC. You can follow any responses to this entry through the RSS 2.0 feed. You can leave a response, or trackback from your own site. If this is because of the diversity charges, they waited an awful long time to put the picture up. Then again, if they put her picture up right away, it would seem like they were caving to activists. I always thought it was odd msnbc didn’t do more to promote the dayside programing. Why not also add Contessa Brewer and Chris Jansing. Not adding them makes this look like a race-based decision. I’m certainly not calling MSNBC racist. But if I were Chris of Contessa, I would want my picture up too. And while they’re at it, they might as well add Lawrence O’Donnell to promote his upcoming show. I recently talking with a liberal friend of mine, and she had no idea O’Donnell was getting a show. I shouldn’t know more about MSNBC than a liberal. Just checked it out myself and Dylan Ratigan’s photo is featured. Maybe they are just featuring the photo of the host on air at the moment. MSNBC just ran a Keith Olbermann and Chris Matthews-style promo for Tamron Hall just a few minutes ago during the Ed Show. I should also note that Tamron has been doing a lot more filling in on the Today Show than normal. She’s probably going to be on a lot more during the summer. I seem to remember a woman from telemundo filling in a few years ago. She could barely speak English. So MSNBC finally shows that have 1 black person working for them….guess that’ll show those racist Teabaggers who have been pointing out the whiteness of MSNBC for months now. A link on Newsbusters. Big time. Not exactly a realisation of Dr. King’s Dream… MSNBC being judged by its characters’ skin instead of their coloured content. Seriously, on air talent comprises a relative small percentage of each network’s staff. There is probably a large set of tangible and intangible considerations the look at to attract viewers and, with the exception of BET, by now I’d think we can assume race ranks way down on that list. Just as it’s wrong to accuse the Tea Party of racial motivations, it is wrong to accuse the same of MSNBC based upon its on air talent selection. Two wrongs don’t make a right…. but three lefts do! I think MSNBC decided to highlight Tamron Hall because she happens to do two hours on the network and she’s also does fill-in work at the Today Show. Rather than it being a racial decision, I think it had to do with the amount of time she gives the network compared to the rest of the networks lineup. The only people who have equal or more airtime than Hall are Joe and Mika with their 3 hour show. Another guess could be her unbelievable good looks….I mean she does look alot better than Matthews, Schultz, Olbermann, Maddow, and she’s about 50 years younger than Andrea Mitchell. Maybe MSNBC finally realized that having hot daytime anchors and promoting them works (check out Fox News). Just a thought! ^^^That argument doesn’t make sense because Hall’s schedule has been that heavy for years now and yet they’re just doing this now? I think it’s just a progression. We’ve been inundated with KO/Matthews/Rachel/Morning Joe/Ratigan ads for months now. It was becoming glaringly obvious that one of the personalities with the most air-time was getting no promotion. It’s her turn. And Contessa had a campaign a couple years ago. in reponse to icn2, the arguement make sense since it hasn’t been “years” that she’s been doing two hours, it’s only been about a year. And honestly the arguement works if you’re not looking for racism. Also, just like joeremi pointed out “Contessa had a campaign a couple years ago”, it could be her turn. I think MSNBC really just wants to promote her more….like her or not, MSNBC sees her as their future. Oh I agree they want to promote her more. The question is why? Because it’s her time or for some other reason? The evidence, or what little there is of the evidence, is open to interpretation. I think someone is looking for the racial reason as motivation rather than the bigger picture. Could it be that beauty sells? Wait, it does, look at the Robin Meade vs Morning Joe for example. I agree, WarVet. Noticing Tamron’s race is about like noticing Halle Berry’s or Michelle Bernard’s: Not the first thing that comes to mind while being blinded by their beauty. “Tamron Hall is good looking, maybe we should put her in some commercials” is not a move requiring much introspection. That’s not enough for MSNBC. Meade’s show is different. It’s all about Meade’s bubbly personality. MSNBC could never get away with that type of promotion in Hall’s case given the format she’s in. icn2, I would love to see the demographics for Meade’s show as it breaks down into male/female viewership. I wouldn’t be surprised if her viewership was 70% or more male. You said “it’s all about Meade’s bubbly personality”, I really don’t think it’s ALL about her “bubbly personality”, I think it could be more about her two assets above her waist and her legs. MSNBC has started to change the format by giving Brewer and Hall wider shots probably aimed at their male demographic.